Leroy Anderson's A Christmas Festival: Quintessential CD Recording? Title: Leroy Anderson's A Christmas Festival: Quintessential CD Recording? 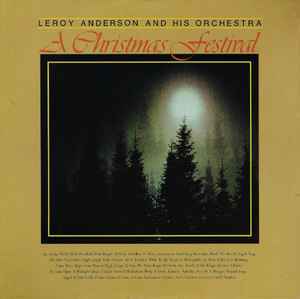 I used to have an LP called "A Christmas Festival" with Leroy Anderson and His Orchestra performing instrumental suites of Christmas Carols. My favorite track on that LP was the eponymous "A Christmas Festival." Sometime back back in the 80s I would guess, I bought an LP of John Williams and the Boston Pops' stereo album "We Wish You A Merry Christmas" which also included Leroy Anderson's "A Christmas Festival." 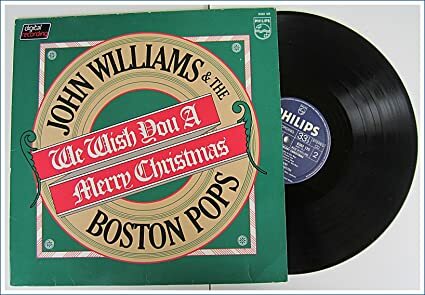 Well somewhere along the line during one of my periodic prunings my LP collection, I decided I only really needed one recording of "A Christmas Festival" and so opted to keep the newer stereo rendition by Williams and the Boston Pops. The other day I felt the need for a shot of pre-Christmas cheer so I pulled the Williams album off the shelf and played "A Christmas Festival" and had so much fun "air-conducting" it that I decided that I needed a CD version in my collection. I checked the county library and found that they had a CD called "Joy to the World" which included "A Christmas Festival" with John Williams conducting the Boston Pops. So I placed a hold on it and it turned up at my local branch yesterday. I popped it into my CD player last night and was carried along by the music until suddenly in the middle of the track at 3:44 a chorus cut in singing "Hark! The Herald." That was a surprise! Up until now I'd only heard the piece played as an instrumental arrangement for orchestra. So, now I'm shopping for a CD and would appreciate your advice on which version I should look for. I prefer the instrumental version without the intrusion of the chorus. And usually digital stereo is more exciting than analog monoaural. But in this case, I'm wondering if an old mono analog recording conducted by Leroy Anderson himself might not be the most satisfying. Which is your favorite recording, Chip? Re：Leroy Anderson's A Christmas Festival: Quintessential CD Recording? That Leroy Anderson Christmas LP that you pictured was a Pickwick Records reissue of Mr. Anderson's Decca Records Christmas LP, which was released in 1959 (pictured above to the right). I'm trying to get both of Mr. Anderson's Christmas albums back into print. It didn't work out this year, but hopefully we'll get clearance from UMG (Universal Music Group) for next year. Mr. Anderson released his original orchestration/medley of "A Christmas Festival" on both his 1955 and 1959 Christmas LPs (Christmas Carols and A Christmas Festival). However, the best version (both technically and artistically) is the stereo version that was released on his '59 album of the same name. And yes, both the '55 and '59 versions of "A Christmas Festival" have the organ at the climactic and triumphant end of the piece. Arthur Fiedler and the Boston Pops had the other great version of Mr. Anderson's "A Christmas Festival." The Pops recorded it on all three of their Christmas LPs (from 1959, 1970 and 1972). But the best version, just like Leroy Anderson's, was coincidently also on their 1959 LP (Pops Goes Christmas). As for the later versions John Williams did with the Boston Pops, I'm not partial to them. Among other things, I don't like the way Williams changed the tempo; and then on his second rendition, added a chorus. Leroy Anderson's version of "A Christmas Festival" is not on YouTube, but posted below is Arthur Fiedler's great version from 1959. And even though it doesn't have the organ at the end like Anderson's, it still has a great climatic ending. As for a CD that you can purchase right now, until I can get the Leroy Anderson albums released on compact disc, I would strongly recommend Arthur Fiedler's 1959 RCA Records Christmas album, which is currently in print by Sony. By the way, the "preview" button when writing a post is located in the top toolbar (it's the icon that looks like a small magnifying glass). Thanks, Chip, for the youtube link to that rousing Arthur Fiedler rendition! I could swear I heard that final organ chord come in at about 8:28. The John Williams version I have on vinyl runs about 30 seconds longer than the youtube video. Is that your main complaint against the tempo of John Williams' version, i.e., that it's too slow? Or that he varies the tempo too frequently and drastically throughout the piece? It's great news that you're going to keep trying to get Leroy Anderson's version released on CD next year. I think I'll probably wait for that release, and for now just try to be content with the youtube video of Fiedler's version. I'm facing a lot of expenses this year: dental work, car repair, new eyeglasses, among others. So I'm having to pinch pennies in order to get by on my monthly Social Security check, which just doesn't seem to go as far as it used to. Thanks for all the hard work you've put in getting our favorite old Christmas albums re-released in pristine new remastered CDs. Yes to both of those questions as to why I don't like John Williams' tempo in his interpretation of Leroy Anderson's "A Christmas Festival." Arthur Fiedler's three versions were all wonderful and all true to the original way that Mr. Anderson orchestrated the piece. As for the organ solo that comes in at the end of Leroy Anderson's two versions, it's only a few seconds long and it comes in at 8:40 on his 1955 mono version, and at 8:49 on his 1959 stereo version. Overall, his '59 version of the complete piece was 8 seconds longer than his '55 version. By the way, I was privileged to have been acquainted with Leroy Anderson's late wife Eleanor, and I'm also acquainted with his son Kurt; in fact, I asked Kurt to write the liner notes for the new 2fer CD that I hope to eventually get out next year. 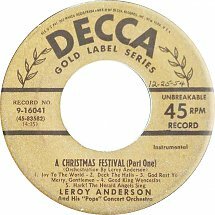 Anderson first recorded "A Christmas Festival" for a 78 RPM release in 1952 (Decca Gold Label Series 16041), with the composition split into two parts to accomodate the two sides of the record. It was also released as a 45-rpm single (Decca catalog #9-16041). However, this is not a different recording as you seem to imply; it is the same recording that was released on Mr. Anderson's first full-length Christmas album, Christmas Carols. 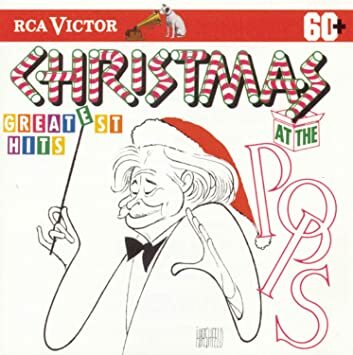 Unquestionably, the best rendition of "A Christmas Festival" is the 1959 RCA recording by Arthur Fiedler and The Boston Pops, from the album "Pops Christmas Party". I bought that CD about 20 years ago. It's required listening for me every year. I still recall "A Christmas Festival" being performed by my high school orchestra for the annual Christmas concert. Both Anderson's and Fiedler's versions are distinct and unique in their own way; but yes, I'd have to agree with you that Mr. Fiedler's '59 version is the best overall. The CD of "Pops Christmas Party" that I bought in 1998 was the RCA Living Stereo edition. It had the orginal artwork and liner notes from the orignal 1959 release. During the 90s, RCA re-released much of their Living Stereo catalog from the late 50s and early 60s on CD. Is that edition still being sold by Sony music today? RCA released that CD reissue of Fiedler's 1959 Christmas LP Pops Christmas Party in 1994; and yes, it is still available today. That's good to know! It's a truly great Christmas album! No, that's not correct; the version on that compilation CD does indeed contain Fiedler's stereo recording (the one from 1959). What a nice surprise! I just listened to it, and sure enough, it's the stereo recording (with the organ at the end!). And I get to keep it until December 26th! Went to see the Pops yesterday in New Brunswick N. J. and they were great. They started with A Christmas Festival including a chorus that had been with them for a few years. The tempo was much better than the Williams recordings .I never thought I would ever hear it live and boy was it wonderful. My wife told me to calm down and I was acting like a kid but if you can't act like a kid at Christmas when can you. I don't know if the Boston Pops still broadcast Holiday at Pops on PBS . I don't see anything listed aropund here. I have an old VHS recording from the early 80's that Williams ended with A Christmas Festival. Chip since you are a Bonanza fan the recording also has Loren Greene doing the Night Before Christmas. Need to get it transfered to DVD.